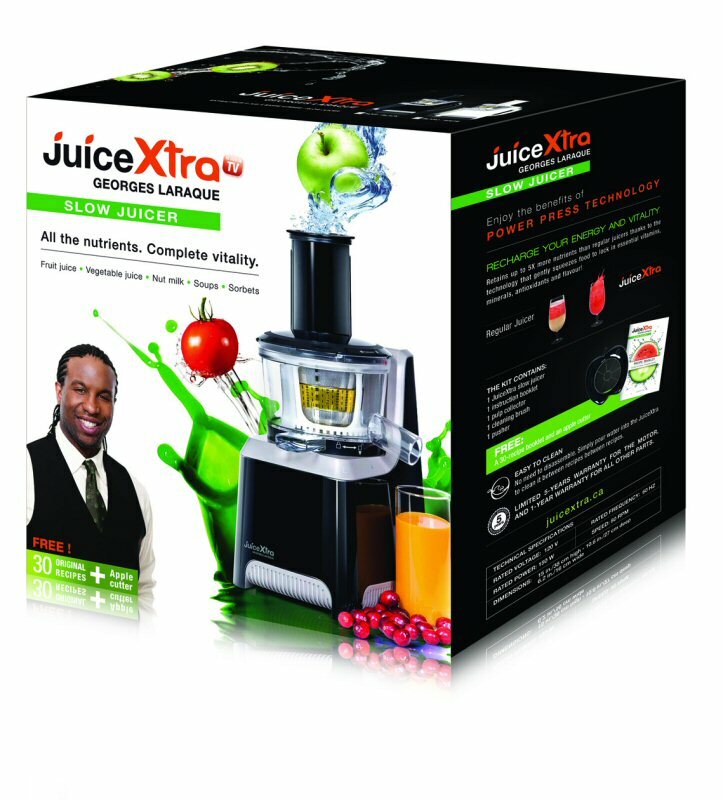 Georges Laraque introduces the JuiceXtra, a revolutionary new juicer that he refers to as "the key to great health for everyone". "My JuiceXtra supplies all the energy that busy bodies need to tackle big work days! ", he says. Georges Laraque believes that great health is attainable by everyone, and that the JuiceXtra can help you achieve it. This exceptional product preserves all the nutrients, vitamins and flavour of food to provide you with the maximum in energy and vitality. The secret is the JuiceXtra's powerful low-speed motor. Unlike traditional juicers, it creates no enzyme-destroying heat, so food's nutritional integrity is preserved 100%. The result-fruit and vegetable juices that deliver 100% purity and 100% taste! But, that's not all! The JuiceXtra is also great for making hearty soups, delicious nut milks, and even sorbet. For more information, recipes, demonstrations, or to purchase online, please go to www.juicextra.ca. Collaboration with Shopping TVA home shopping Show. Watch Georges Laraque use his JuiceXtra at 1:30pm daily on the TVA French Network's Shopping TVA home shopping Show. A member of the TVA Group, TVA Boutiques is a leading Quebec retailer specializing in the sale of diversified products by mail order, e-commerce, and wholesale distribution across Canada. TVA Boutiques is the umbrella banner to a family of distinct stores, including Shopping TVA, Bijouxcarolineneron.com, Boutique en Forme with Josée Lavigueur, and Shopping Clodine. Each store operates as an independent entity, with its own unique categories of products and target audience.